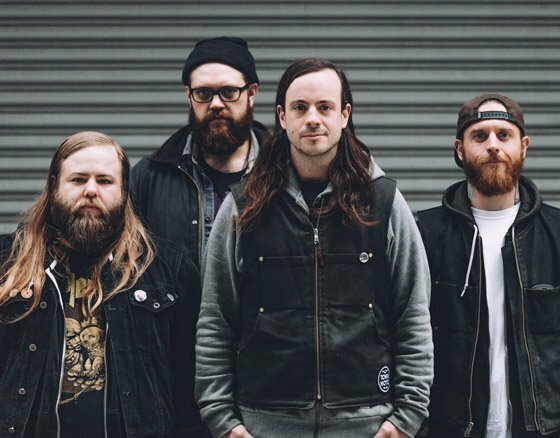 "Too many friends died this year," screams Cancer Bats frontman Liam Cormier at the end of "Arsenic in the Year of the Snake," a track that premiered back in October. It was a fitting introduction to their new album, written during a period when the band were mourning the loss of a number of friends. But one needn't look any further than the debut video off Searching for Zero for a testament to the band's enduring positivity, even when confronted with what might be considered some of their darkest days. "Satellites" features a pile of fireworks — around $700 worth, in fact — most of which are blasted directly at drummer Mike Peters, an idea that Cormier came up with after "shooting off tons of fireworks at weddings and cottages" during the previous summer. "I'd buy like $200 worth and think 'That was crazy. What would happen if I bought $1,000 worth of fireworks?'" he explains over Americanos at a west end Toronto cafe. "These things kept happening, so a lot of [the album] was how was I going to work through it all," Cormier says. "And just the fact that we continued being a band helped us with that." He explains that the band took an entire year off to both "go get interests" outside of Cancer Bats and then work on new material. Having signed with BMG, they were afforded the time to make the record the way they wanted. "They were like, 'Take as much time as you need. We just want it to be good. We realize that this is your fifth record so I'm sure you need to recharge.' We just tried to write a song a day, five days a week. Every day, we'd write a song and record it. And everyone could bring in ideas, so nothing was too weird. We tried to have categories, though, so we could keep on track. We had punk songs, stoner songs and metal songs. It ended up being too many stoner songs." "He really wants you to explain what all the songs are about so that everyone is feeling that emotional weight. It's cool because a lot of the songs on this record are pretty heavy, but he was like, 'This needs to be [positive]. I don't want to put this record out to bum people out, because you're not bummed out now. So this needs to be both. You need to be celebrating that person's life while playing.'"